Whether you’re not heading home for the weekend or just want to show your close friends you’re thankful for them, a Friendsgiving is the perfect way to enjoy some turkey and cranberry sauce without the stress that can come with seeing family. Here are some tips to help you host a successful gathering. 1. Set out seven chairs: This is the perfect number of chairs for any amount of friends who decide to come to your dinner. 2. Don’t cheap out on the ladle: Spare no expense and invest in a ladle that is truly world-class. 3. 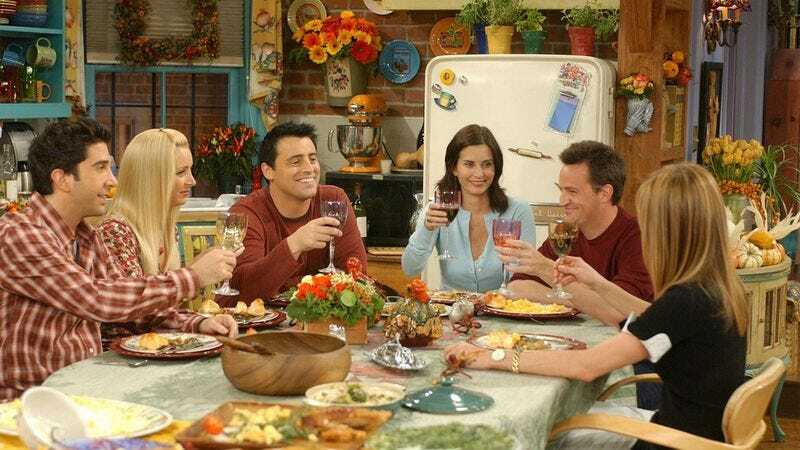 Cut the phone lines: Nothing ruins a Friendsgiving like everyone rushing to use the phone. If your friends have cell phones, jam them. 4. Instead of calling them “rolls,” call them “friend rolls”: This will help drive home the core theme of Friendsgiving so that there’s no confusion. 5. Ask your friends if they’re going to play any basketball in the next six months: With all of your friends gathered together in one place, it’s a perfect time to see if any of them plan on hooping it up at all in the next half-year. 6. Steer all conversations away from divisive topics like boating: No one wants to attend an awkward Friendsgiving. As the host, it’s your duty to make sure that all of your guests feel comfortable. 7. Be ready for Dad: He is not your dad. He is not your friends’ dad. But when you see him, you will know it is him, and he sits at the head of the table always. 8. Watch the Friendsgiving scene from Full Metal Jacket: Nothing in cinema history evokes the spirit of Friendsgiving quite like the flawless Friendsgiving scene in Stanley Kubrick’s classic Vietnam War film Full Metal Jacket. The scene is only 20 minutes long, so it won’t derail the festivities too much if you have your Friendsgiving guests watch it to remind them what this holiday is all about!